Creating a complete numerical towing tank or “virtual basin” is an ambitious task in marine hydrodynamics and has come close to realization owing to extensive progress in computer technology over the past twenty years. However, pure virtual testing does not reach the accuracy of results obtained in real-life experiments. Future ship design may therefore be considered a mélange of improved accuracy in virtual testing and integrated design optimization. 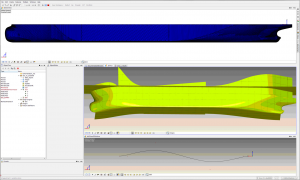 The VIRTUE Integrated Project (‘Virtual tank utility in Europe’) thus aimed at developing new and improving existing software to produce a complete toolset for the provision of marine hydrodynamic services, i.e. a comprehensive simulation environment to complement real test basins for the investigation of ship behaviour at sea, both at full scale and in real sea conditions. The set-up of an integrated IT platform including resistance, propulsion, seakeeping, manoeuvring and cavitation prediction brought together academia, model basins, software providers and consultancies. With this focus, VIRTUE tied the expertise and creative potential of leading European marine CFD research, development and consulting centres, among them FRIENDSHIP SYSTEMS. FRIENDSHIP SYSTEMS contributed to the project by providing the software system CAESES, development and expert assistance. CAESES was used as a modeling engine, for CAD tasks such as geometry definition and variation, and for optimization, thus facilitating case studies and test scenarios within the VIRTUE scheme. By origin a R & D initiative of the European Commission (EC), the VIRTUE project was launched in January 2005 and finalized in May 2009. It was set up under the umbrella of the 6th EC framework program for “sustainable development, global change and ecosystems”. For in-depth information please check out the websites of VIRTUE www.virtualbasin.org and project coordinator HSVA (Hamburg Ship Model Basin www.hsva.de).